What: Scarboro Heights Historic Sites Walking Tour -- Part Two -- including the Doris McCarthy Trail down Gates Gully to "Passage". Tour Guides: Bruce and Bea McCowan of the "Scarboro Heights Record". How to Order "Neigh the Front" and Register for the Tour: Send $17.00 cheque to the James McCowan Memorial Social History Society, c/o 19 Monarchwood Crescent, Don Mills, Ont., M3A 1H3, 416-447-4895 (Includes postage). This is the order form and here are some reviews of Neigh the Front. Want to keep the tour guides busy? -- Pick some tough questions from "Historic Sites" and "Notable Events"! Bring your camera and your copy of Neigh the Front for handy reference! Art is all about interpretation. It would not be art if there was but one "right" answer to the question "what does it mean"? Bruce and I have the following interpretation of "Passage". There is a concept in some computer programming languages called "pointers". These pointers actually "point" to places in a computer's memory where information is stored. Using the pointers, the computer accesses that information to perform processes which, ultimately, do useful things for people. Similarly, the twenty-plus pairs of ribs pointing upwards on Passage are also pointers to valuable information. Each pair of ribs is associated with a date. Each of the dates represented in Passage is the key to a significant event in the evolution of Doris McCarthy's Place by the Bluffs and the People who lived in the area. Not unlike those programming languages, Passage points to valuable information that we can process with our minds and interpret for the benefit of society. Passage points to written works such as Neigh the Front, to stage productions such as With I Hope a New Face, to heritage interpretive programs such as Walking Tours and Exhibitions, to educational tools such as the Information Processing program, to the Toronto Lost Sites Project and to many other efforts to tell the story of humanity's journey through time in this place. Just as computers do useful things for people, so too can our heritage resources -- if we take the time to understand and interpret our heritage. To some extent, "History" is synonymous with "Experience". We've all heard the phrase, "learn from experience". For example, engineers learn how to avoid mistakes in structures by gathering, categorizing and analyzing data associated with failures in the past. One of our challenges is to find other effective ways to make our heritage "useful". We can't just point to it -- we must do something with it to make our world a better "Place" to live. Please join us on May 24 for our Walking Tour to Passage. Bruce and I were very pleased to help Marlene with the development of Passage by linking people and place through the passage of time. We provided the 20 most significant dates in the history of Doris McCarthy's "Place" at the edge of the Scarborough Bluffs. Here they are in brief -- more details to follow in future issues. A plaque with the dates and some details will be erected beside Passage. 23,000 BC Lake Iroquois forms. 8,000 BC The height of land on lots 21-22, a short distance from and above the McCarthy property, is the earliest known site of human occupation in Toronto -- 10,000 years ago. 1793 The first European settlers in Scarboro Heights were the Annis brothers (1 mile east of Passage). 1800/01 Kingston Road blazed by Annis and Cornell and other early settlers. 1837 Scarborough Militia was the first township militia to arrive in Toronto's defence. 1850 Scarborough Township first municipal government meeting. 1856 Grand Trunk Railroad -- first train through Scarborough. 1891 Survey Plans for development of Lots 20, 21 and 22 along the lakefront. 1892 Scarborough dairy farmers conceive and establish the Milk Marketing movement in Ontario. 1905 Electric Radial Line extends through Scarboro Heights. 1906 Scarborough Heights Park established. 1907 Geodetic Survey Tower built on highest point of land on the Bluffs on lot 22. 1915 Wreck of the Alexandria. 1949 Subdivision plans registered for lot 22 by Ashley and Harold McCowan. The present residential areas are finally developed. 1986 Erosion Control work begins in Gates Gully (Bellamy Ravine). 1992 Royal Commission on the Waterfront. 1998 Scarborough no longer exists -- amalgamated into Toronto. 2000 Doris McCarthy Trail opened. 2002 Installation of the sculpture Passage in honour of Doris McCarthy. I was very pleased to attend the June 2 2002 Garden Party for Passage. About 100 people gathered at "Fool's Paradise" for the final draw for the models of Passage and to celebrate that the fundraising for this important public art project is complete. The large macquette was won by Nancy Cuttle of Etobicoke. After the draw, a number of us took an enjoyable walk down the Doris McCarthy Trail to the spot where "Passage" will be installed this fall. Please stand by for further details of this next public event! Passage is the second in a series of sculptures to mark people and place across Canada. The impetus to mark Doris McCarthy and her Place, the Scarborough Bluffs of Lake Ontario, came from Doris' art and her intense relationship to place. Doris is singular in her passion for the geography and landscape of Canada, whether it be Scarborough, Georgian Bay, the Arctic, or the many other magnificent places she has painted throughout our land. Passage as concept incorporates the form of the ancient double pointed oval symbol for female, "vesica piscus", to symbolize Doris. The elegant form of ribs add further to the symbolism, sweeping upwards to reference gothic windows, the Great Lakes' fish, and the explorer's canoe. Passage links together the idea of one's passage through life; the passage of a soul in a journey of faith; the passage of the fish through the water of this place; and passage of the canoe that has explored our land. 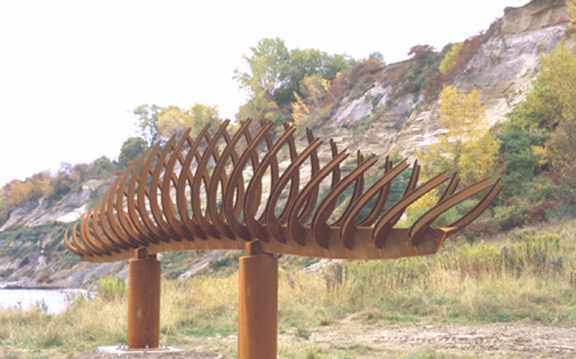 And here is my own vision for public art in Scarborough. Moreover, here is another idea for how public art can help us appreciate the sacrifices of our past nation-builders -- by erecting public art at sites of our lost heritage. "Passage" was supported by the Friends of Doris McCarthy, the City of Toronto Economic Development Department, Toronto Conservation Authority, Stevenson Paints, Mackey Type and Design Studio and the Province of Ontario Ministry of Culture.